Anne Gorsuch Burford (April 21, 1942 – July 18, 2004), also known as Anne M. Gorsuch, was an American attorney and politician. 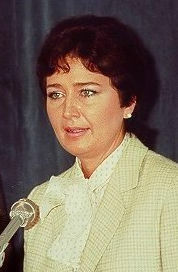 Between 1981 and 1983, while known as Anne M. Gorsuch, she served under President Ronald Reagan as the first female Administrator of the Environmental Protection Agency (EPA). She was born in Casper, Wyoming. Burford was married to David Gorsuch from 1964 until they divorced in 1982. They had two children, including Judge Neil Gorsuch, who is President Donald Trump's nominee to United States Supreme Court. In 1983, she married Robert Burford. He died in 1993. They had one child. Burford died in Aurora, Colorado from cancer on July 18, 2004, aged 62. This page was last changed on 12 June 2018, at 22:48.